Sculpture by the Sea had its 10th anniversary along the spectacular 2km Bondi to Tamarama coastal walk in Sydney, Australia, for three weeks in November 2006. 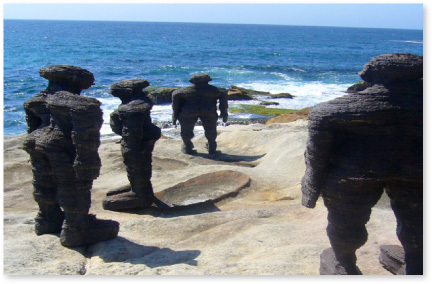 Sculpture by the Sea featured 108 works by artists from 15 different countries across the globe. Conceived by David Handley in 1997, as a temporary exhibition showing a marriage of sculptural works and Australia's sublime coastal landscape, Sculpture by the Sea has evolved from a humble one-day event organized by volunteers working out of David's living room, to become a bi-coastal series of annual exhibitions that captures the nation's imagination. This film follows the journey of David and his team at Sculpture by the Sea over the past decade to show how and why Sculpture by the Sea has become one of the most unique Arts events in the world.